(Nanowerk News) Introducing flaws into liquid crystals by inserting microspheres and then controlling them with electrical fields: that, in a nutshell, is the rationale behind a method that could be exploited for a new generation of advanced materials, potentially useful for optical technologies, electronic displays and e-readers. A team of scientists (including research fellows at the International School for Advanced Studies, SISSA, in Trieste) has just published a paper in the journal Physical Review Letters ("Field-controlled columnar and planar patterning of cholesteric colloids") where they describe just how this approach works and provide the results of a computer simulation. “Generally, flaws are the last thing you’d want in a liquid crystal”, explains Giuseppe D’Adamo, postdoctoral fellow at SISSA. “However, this new method allows us to exploit the defects in the material to our advantage”. D’Adamo is first author of a paper just published in Physical Review Letters. The study made computer models of colloidal suspensions in liquid crystals subjected to electrical fields modulated over time. Colloids are particles in suspension (i.e., a condition halfway between dispersion and solution) in a liquid. These composite materials have been receiving plenty of attention for their optical properties for some time now, but the use of electrical fields to modify them at will is an absolute novelty. “Our simulations demonstrate that by switching on or off an electrical field of appropriate intensity we can re-order the colloids by arranging them into columns or planes”, comments Cristian Micheletti of SISSA, co-author of the paper. “This easy-to-control plasticity could make the material suitable for optical-electronic devices such as e-readers, for example”. “The useful natural tendency of liquid crystal molecules to spontaneously arrange themselves in a certain pattern can be counteracted by introducing colloids in the fluid. In our case, we used microscopic spherical particles, which ‘force’ the molecules coming into contact with their surface to adapt and rotate in a different direction” explains D’Adamo. “This creates ‘defect lines’ in the material, i.e., circumscribed variations in the orientation of molecules which result in a local change in the optical properties of the medium”. These defect lines have an important effect: they enable remote interactions among colloidal particles, by holding them together as if they were thin strings. “Liquid crystal molecules tend to align along the electrical field. By switching the field on and off we create competition between the spontaneous order of the liquid crystal, the order dictated by the surface of the colloidal particles and, finally, the order created by the electrical potential”, says Micheletti. 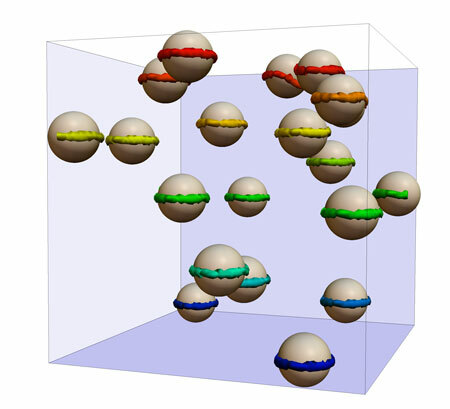 “This competition produces many defect lines that act on the colloids by moving them or clustering them”. “It’s a bit like pulling the invisible strings of a puppet: by carefully modulating the electrical fields we can, in principle, make all the particles move and arrange them as we like, by creating defect lines with the shape we want” continues D’Adamo. “An important detail is that the colloidal configurations are metastable, which means that once the electrical field has been switched off the colloids remain in their last position for a very long time”. In brief, this implies that the system only requires energy when it changes configuration, a major saving. “In this respect, the method works like the electronic ink used in digital readers, and it would be interesting to explore its applicability in this sense”, concludes Micheletti. The study, carried out with the collaboration of SISSA, the University of Edinburgh and the University of Padova, has been included as an Editors’ Suggestion among the Highlights of the journal Physical Review Letters.